My good friend Erin is an author, a bookseller, and, most recently, a blogger. Her blog One Good Deed chronicles her attempt to do one good deed every single day. 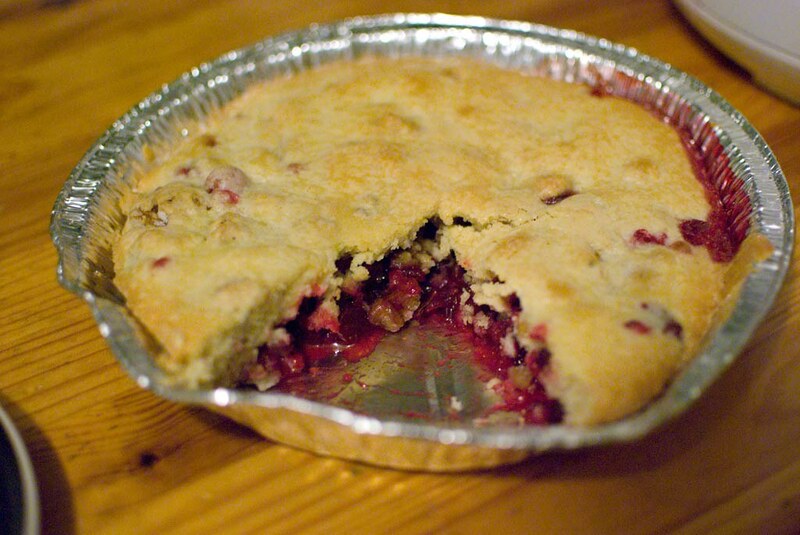 In a recent post she mentioned something called Cranberry Surprise Pie, and at first neglected to give us the recipe. Thankfully she added it to the post, and I’ve since made four of them. The recipe (reprinted below, and found at Erin’s blog) seems to have originated in the 1950’s, and is remarkably simple. It’s my favorite kind of recipe, actually — one that easily accommodates slight changes. I made a batch with fresh ricotta and lemon zest added to the batter. You could also substitute other fruit, I think, though Erin tells me she’s never tried it with anything other than cranberries. I do think that tart fruit would work best, to match with the sweet and crispy crust. It took me a while to figure out what the Cranberry Surprise Pie reminded me, of, but I eventually figured it out: the French dessert clafouti, which is basically a rich pancake batter poured over fruit. The biggest difference being that clafoutis usually include milk or cream in their batter. Preheat oven to 325 degrees. Butter a 9 1/2″ pie plate. 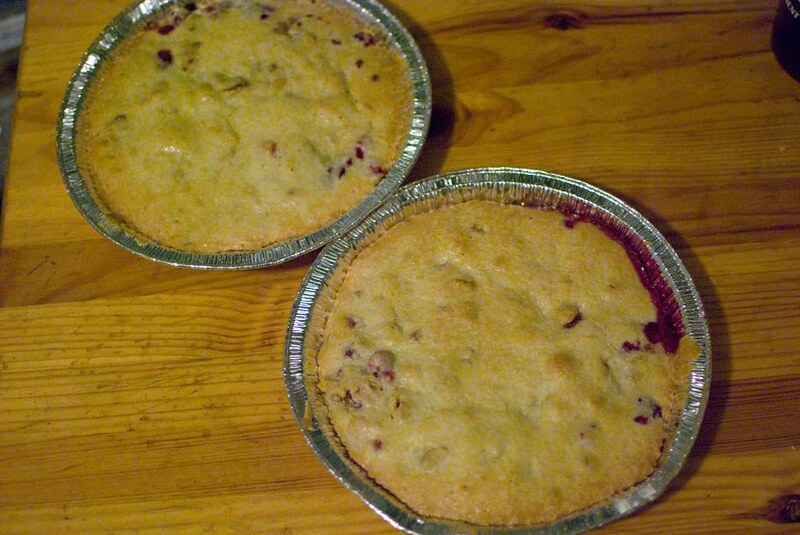 Pour cranberries into bottom of pie plate and sprinkle evenly with walnuts and 1/2 cup of white sugar. Mix 2 beaten eggs with 3/4 cup melted butter, 1 cup sugar, vanilla, and 1 cup flour. Pour over cranberry mixture. Bake 50 minutes at 325 degrees. Despite the fact that there is no bottom crust the pie holds together beautifully. There’s just one question, and not even Erin can give me an answer: What’s the surprise?